The Collaborative Economy enables people to efficiently get what they need from each other. People use powerful technologies that enable Crowd-funding, Peer-to-Peer lending, the Maker Movement, and the Sharing Economy. If you look closely, the crowd is becoming like a company: self-funding, designing, producing, and sharing what people already have. Similarly, in nature, honeycombs are resilient structures that efficiently enable many individuals to access, share, and grow resources within a common group. Various types of bees work in a collaborative manner to feed, care, and nurture offspring, thus growing the colony. The honeycomb structure itself supports the whole by spreading the load across the structure, wasting little in its design, and easily replicating at scale. 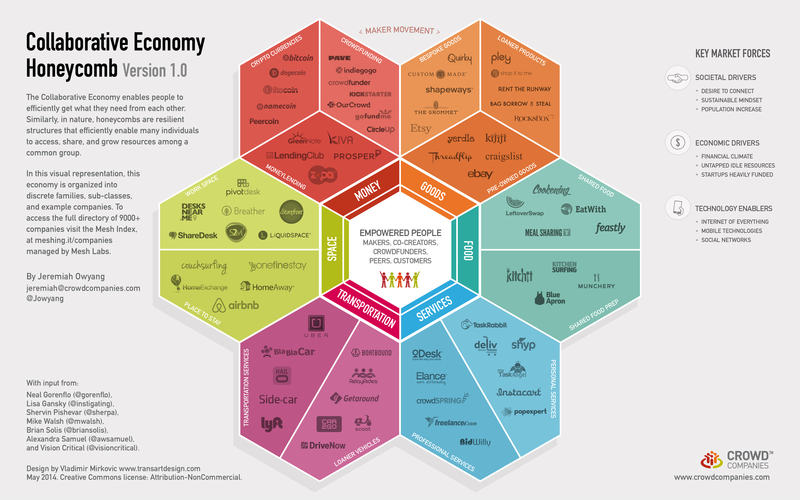 In this visual representation, the sharing economy is organized into six discrete families of goods, services, space, food, transportation and money. These are broken down into 14 sub-classes, including bespoke goods, personal services, and workspace, within which we have identified dozens of example companies, like Airbnb, Uber, and Shapeways. In previous taxonomies, we noted five families, but now we’re witnessing significant growth in the food sector, deserving its own hexagon. The companies listed in this graphic are just a small representation. There are over 9,000 such companies, varying by country and geographical location. To access the full directory companies, visit the Mesh Index, at meshing.it/companies managed by Mesh Labs run by Lisa Gansky. Model adoption set to double, say over 90,000 survey respondents. There are over 9,000 startups catalogued in the Mesh Index. Investors are heavily funding this market, with over $850m invested in the month of April alone from a number of sources, including Google. The establishment demonstrating resistance with the likes of regulators, hotels, taxis, and others balking. Over 80 corporations have joined the movement. See this timeline. One of the inspirations for this graphic was the work of friend and former colleague, Brian Solisdid, on the first phase of sharing, which originally catalogued social media as the Conversation Prism. While we explored a variety of ways to present the information, the radial-like nature made the most sense. Brian was generous with his time, providing feedback, insight, and more, based on his experience managing many variations throughout the years. Published in celebration with today’s Ouishare Festival in Paris, with a focus on the Collaborative Economy and the impacts it has on society. A Thank You to Lisa Gansky @instigating, Neal Gorenflo @gorenflo, Shervin Pishevar @sherpa, Mike Walsh @mwalsh, Brian Solis @briansolis, Alexandra Samuel @awsamuel, of Vision Critical @visioncritical, and Vladimir for the graphic design.